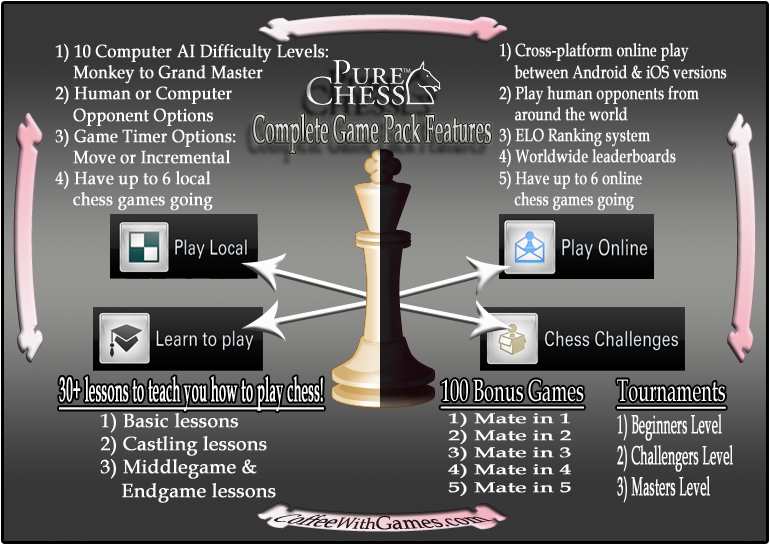 How the Pure Chess main menu appears. 1) Play Local - The ability to play one local chess game at a time on your Android/iOS device, against either a human or computer opponent. a) This offers two difficult settings if you want to play against a computer opponent. Monkey AI is the lowest difficulty, and well, it's apparently like playing against a monkey. Monkey AI has been an excellent difficulty for showing Bean 1 how to play move different chess pieces around. b) For those chess fans that enjoy timed matches, you also have the option of using a game timer if you would like. You can select to have it do a time limit per move, or you can select an incremental timer option. 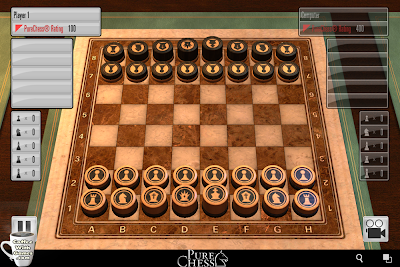 2) Play Online - The ability to enjoy one online "Play By Mail" chess game at a time on your mobile device. This allows you to play other Pure Chess owners from around the world in chess matches, and I have already used this feature to play two online chess matches, against Matt and Chris from DigitallyDownloaded.net. It works extremely well, and even shows you the moves previously made in the match, so that you can remember what exactly was happening if you take a break from the game and come back a few hours (or, even days) later. 3) Chess Challenges - This area has two sections for players to use and improve their chess games: Bonus Games or a Tournament. a) Bonus Games are where you try and get checkmate in a certain number of moves. The Bonus Games start with "Mate in 1" and go all the way up to "Mate in 5". With the free version, you have access to the first two problems under each one, for a total of 10 Bonus Games. b) The Tournament section will allow you to play in a Beginners Tournament in the free version, but also has a Challengers Tournament and Masters Tournament. 4) Chess Set Pieces - The checker based chess pieces (seen in the image above) are the set pieces in the free version, with three appearances to choose from: wood, metal, or plastic. The basic checker based chess pieces. 5) Teaching - Under the "Learn to play" section there are 24 lessons which are very helpful for someone that perhaps has never played chess, or someone that has only played a few chess games and needs a refresher course. These lessons will show you the basic chess piece moves, and how to capture with the pieces as well. There are a few slightly advanced chess moves and rules not covered in the free version, such as castling, but you do get those extra lessons in the full version of the game, or even as a lower priced separate option if you're just looking to learn chess. Now, if you buy the Pure Chess "COMPLETE GAME PACK", what will you get? 1) Forest Game Pack - This includes a calm forest environment and classic Lewis chess set. 2) Temple Game Pack - This includes a temple environment setting, with an Imperial Roman army chess set. 3) Park Game Pack - This includes an Autumnal park environment, with animal based chess pieces. Think rabbits, owls, mice, and more! 4) Halloween Chess Set - Well, take a look at the image below and the screenshot on the left to get an idea of what you can expect from this spooktacular chess set! The Pure Chess Halloween and Park Chess Sets. 5) Easter Island Chess Set - Have you ever been to Easter Island? If not, you can read about the island and the Moai that inspired this chess set, HERE. 6) Staunton Chess Set - This chess set has been around since the mid-1800s, and you can read about it, HERE. 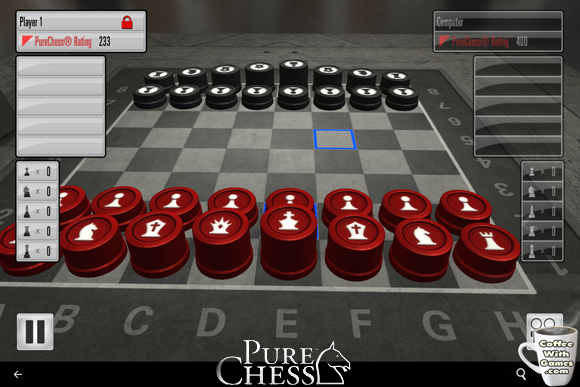 This Pure Chess chess set is shown below, in the left screenshot. 7) Battalion Chess Set - Shown below, in the middle screenshot. 8) Williams Chess Set - Shown below, in the right screenshot. The Staunton, Battalion, and Williams Chess Sets. Click image to enlarge. Google Play store version, HERE. Amazon App store version, HERE. Pure Chess' free basic version is like a coffee shop giving away a free small cup of coffee, and then charging a little for the extras. You can enjoy the deliciousness of the original brewed coffee, but if you perhaps enjoy your coffee drinks a little sweeter, you have all sorts of options. 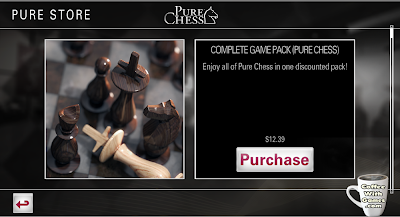 If you don't want to buy the Pure Chess Complete Game Pack, no problem. You can pay for just the option(s) you want to make your chess experience, just a little bit sweeter. What if you don't know much about chess and just want to learn more, without buying the full version? They give you the choice of buying just a Difficulty & Tutorial Upgrade, for $1.07. Want access to the extra checkmate puzzles and the harder, more advanced chess tournaments? You can buy the Challenge Upgrade for $1.07. Want the extra chess sets and locations? You can buy them individually. Want to have the ability to play more than one local and online chess game at a time? You can buy the Multi-Game Upgrade, which only costs $1.07, allowing you to play up to 6 local and 6 online chess games without buying the full game. If you want to go big though, and for example make your free small cup of coffee a large cup, you can certainly do so with the Pure Chess Complete Game Pack. While I am holding off for the Wii U version before making an initial purchase, I will go with the equivalent of the Pure Chess Complete Game Pack on the Wii U when the game releases. Once I do get the Wii U version though, I will probably also go with the Multi-Game Upgrade option on the NOOK version I am currently using. Which, if you're not aware of what the NOOK HD+ Tablet is, it is an e-Reader based tablet device from the U.S. book retailer Barnes & Noble. From my own personal experience of playing chess in a coffee shop, if I was Barnes & Noble I would try to get Pure Chess downloaded to every single NOOK HD+ Tablet before it's sold, and help use that as a way to promote in store chess tournaments on their own device. If you have Pure Chess downloaded already, my Ripstone account name is CoffeeWithGames. Feel free to send me an online match challenge, and I'll accept it once my current match is over. 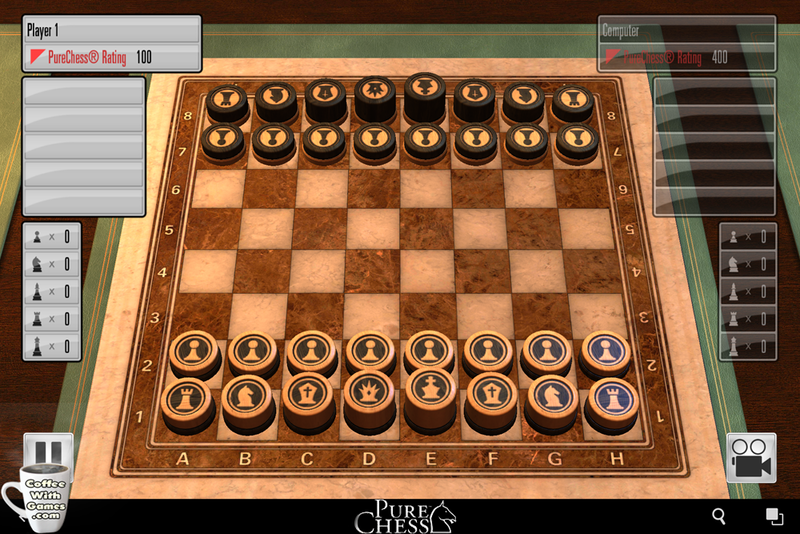 Have any of you been playing the new Android or iOS version of Pure Chess, and if so, what do you think about it? *Disclaimer: I downloaded the free mobile version of Pure Chess. For me, it's a slog to get through the menus honestly. Everything I do takes up to 5 or 10 seconds to process. I am a bit low on storage memory - only about 500mbs left, but it just seems strange to me that it runs so poorly on my iPhone 4, but a really visually intense title like Infinity Blade II hums along without a hitch. I actually haven't timed how long it takes to hop between the different sections, and being that I don't use many apps in general, I wonder if it's just me not comparing it something else I might use on a more regular basis. My semi-smartphone takes probably 10-20 seconds just to get the browser page open, BEFORE even attempting to go to a site. If you downloaded it the very first week/weekend it released though, and haven't really tried it since, I think it might have had one update already. Not 100% positive though. Thanks! Putting these things together always takes me A LOT longer than I expect, and a lot of that time is usually on editing images together. Why other writers can't seem to put their thoughts into clear words the way you do is beyond me. I truly appreciate your valuable information.